UP Government will hand over 5 new medical College, Super Speciality Hospital for Uttar Pradesh People. 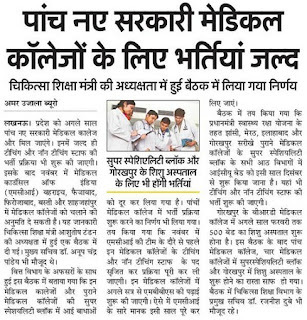 From December More than 1,000 vacancies going to recruit by Health Department of UP and all posts will Teaching and Non Teaching staff which means Doctor, Clerk, Accountant, Staff Nurse, Professor, Junior Senior Residents etc jobs are reserved in 5 New medical college. Savitribai Phule Scholarship Form will help students especially girls get benefitted on Savitribai Phule Scholarship. Savitribai Phule is a courageous woman who fights for education of girls in Indian System. Under the time of Savitribai Phule, when she was born than nobody takes of girls education. They prefer marriage instead of education, so Savitribai Phule belongs to backward community and have done many good things on empowerment of students. Dori Lal Agarwal Scholarship For Physically Handicapped Students After completing the online application of Atul Maheshwari there is new scheme came Dori Lal Agarwal Scholarship for Students, The main eligibility of Amar Ujala Foundation Dori Lal Agarwal Scholarship favors to Physical Handicapped person (Viklang meaning in Hindi). Avasar Foundation has invited interested girls to fill form of Avasar Scholarship for Female Girls Students in India. Avasar is an Opportunity Foundation trust which runs in small organization but have bigger thinking in providing social welfare education scheme. Avasar Authority wants to change Girls career who wants some special financial assistance. UP CPAT Counselling 2018 is Released Combined Pre Ayush Courses B.A.M.S. B.U.M.S. B.H.M.S Download 1st 2nd Round Seat Allotment UP CPAT Counselling Dates.